Last Friday I had the opportunity to attend Think Brownstone Inc.’s 2nd Annual Open House Celebration. It was a great event, catered by Charles Roman Catering, which attracted about 150 fans ranging from local business owners to top-level executives from some of the area’s top pharma and financial services companies. 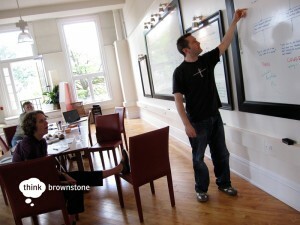 Carl White and Brian McIntire started Think Brownstone about 2 ½ years ago because they knew there was a better way to help their clients solve complex business problems: by employing design thinking at every step of the process. This goes beyond the traditional idea of design being about the “pretty pictures” – while aesthetics are important, they’re just the wrapper. Going deeper, it’s about how universal design principles can be applied to create intuitive and enjoyable experiences that power customer loyalty while driving innovation in applications, services and processes. 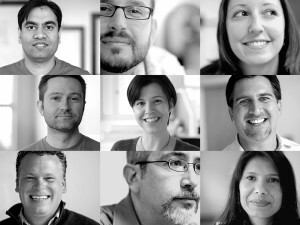 They must have been onto something because they’ve managed to grow the company and build an impressive roster of clients in the midst of a recession when most businesses are struggling to keep their customers. Then again, their attention to every detail of the experience at their Open House shows that they’re not just talking the talk, but walking it too. 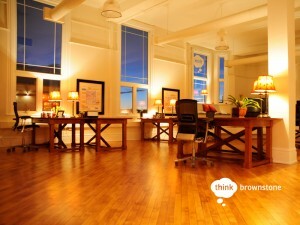 If you’ve been looking for a competitive advantage in this challenging environment, it might be time to get energized by the Think Brownstone crew.